Anyone who ever tried to improve some aspect of their website knows that they have to have some way to decide whether the improvement initiative was successful or not. This ‘measure’ of success could be an opinion from a colleague or from website visitors (qualitative data); it could be a survey where the respondents provide a rating (semi-quantitative data); or it could be an actual measurement like the speed of the site or the ranking on Google or whatever (quantitative data). As you go from qualitative to semi-quantitative to quantitative, the amount of confidence you can have in your results get stronger. For example qualitative data may depend on how much the person you are asking likes you and may therefore be biased and may have little to do with your site. On the other hand Googles ranking is based on a number of measured factors and therefore is the same for everyone and will have not real bias (or so they say and we have no reason to believe otherwise). Therefore in the case of quantitative data, not only can you measure your performance improvement relative to the number one position on Google, but you also can compare your ranking position (SERP) to your competition. As Search Engine Optimisation (SEO) Experts we need to get the most powerful results possible for our clients so that they can decide whether they are getting value for money from their investment in ongoing SEO improvements. We therefore use quantitative data wherever possible and search engine ranking position (SERP) is an obvious and very sound measurement (metric) for our clients. It is of course very easy to get your search engine ranking position and your competitors SERP by typing a search term into Google and then you can record the rank positions of interest. By repeating this every few days, you can get a baseline for your performance and for your competitors’ performance. When you make changes you your site, these results will allow you to see if your efforts led to improvements and were worthwhile or if you have done something that should be rolled-back because the change had an adverse effect on your ranking. Getting these ranking positions every day does not take too much time, but it is tedious especially if you have a number of competitors that you want to track or if you have to search through a long list of search results and then count the position for your site and for your competitors’ site. Also, this counting can be inaccurate if you are scrolling through pages on the screen. Added to this, you need to remember to take the measurement every day and all the little bits of time add up over time. 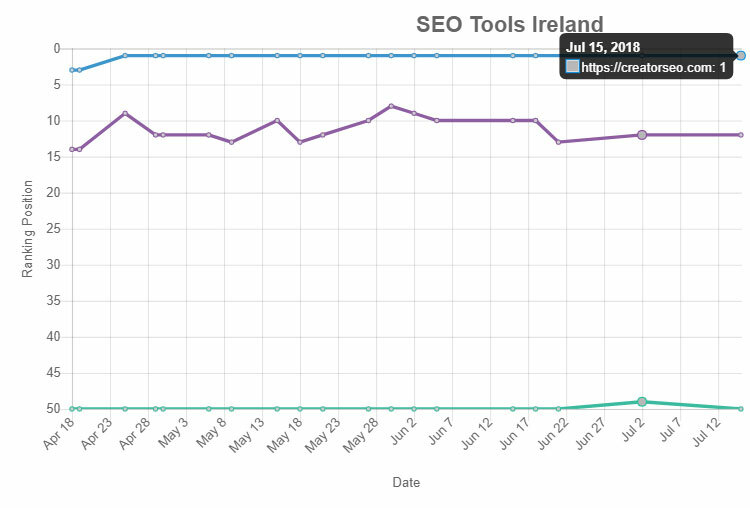 This manual approach is just not viable for busy people or for companies like ours (CreatorSEO – SEO Ireland) who we deal with a number of SEO clients every day. We therefore invested our time on the development of code that automates the process and capture or ranking data for our clients’ sites. This software automatically captures our clients’ SERP results and their performance relative to their competition every day and this released up a lot of time that we could use on the actual improvement process rather than the expensive tedium of getting results, adding these to charts and then analysing whether previous changes led to improvements or not. Many of our clients use WordPress as the Content Management System of choice for their website and consequently, we adapted our software so that it could easily be installed on WordPress as a plugin. This made our software immediately available to at least 90% of our clients. As WordPress has made it easy to share and distribute useful software, we decided to make our plugin available on WordPress for anyone to use. Our plugin is called ‘Hub5050 Ranking and Competitor Tracking’ and you can find it on the WordPress plugin site at https://wordpress.org/plugins/ranking-and-competitor-tracking/. As it stands, the plugin allows 5 search terms and 2 competitors, but this will be extended in time. The core plugin will remain as a free offering on the web, but there will later be premium functionality for clients who want more than just SERP results. This WordPress plugin is relatively new and there will be improvements over time. We have done our best to make the plugin secure and have followed the WordPress development guideline as far as was feasible. If you want to read more about this ranking and competitor tracking software, please have a look at the linked page on this website. While I constantly refer to ranking position on Google, this is only because most people are familiar with Google. Ranking position on the other major search engines like Bing, Yandex, Baidu etc. are also very good metrics and you can replace ‘Google’ with any of these engines when you read this text.